August 22, 2018 at 7:17 pm. Buffalo Bills quarterback A.J. McCarron returned to practice on Wednesday for the first time since sustaining what as initially reported to be a hairline fracture of his collarbone against the Cleveland Browns on Friday. McCarron was limited in practice, multiple media outlets reported. Bills coach Sean McDermott has since dismissed that report that McCarron broke his collarbone. 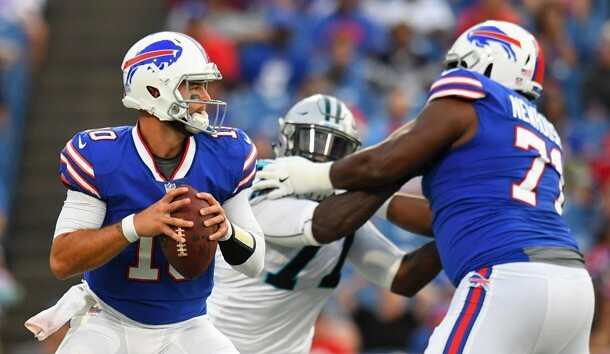 McCarron is expected to rejoin the quarterback carousel that has rookie Josh Allen expected to start over Nathan Peterman against the Cincinnati Bengals on Sunday. –The Kansas City Chiefs released running back Charcandrick West, the team announced. West had been sidelined for most of training camp because of a concussion before being cleared for padded practice on Tuesday. His roster spot became expendable with the arrival of free-agent running back Damien Williams, the emergence of undrafted rookie Darrel Williams and the return from injury of Spencer Ware as backup options to starter Kareem Hunt. Williams is expected to serve as the team’s primary receiving running back, a role West had enjoyed during his time in Kansas City. –President Donald Trump took issue with ESPN after the network’s president announced that it would not air the national anthem during “Monday Night Football” broadcasts. Trump spoke at a rally in West Virginia on Tuesday night and addressed the familiar topic of some NFL players kneeling during the national anthem. “You’re proud of our country, you’re proud of our history, and unlike the NFL, you always honor and cherish our great American flag,” Trump told the crowd in Charleston. –Free-agent safety George Iloka signed a contract with the Minnesota Vikings, the team announced. Terms of the deal were not announced by the Vikings, who also claimed rookie fullback Luke McNitt on waivers. Iloka, who was released by Cincinnati on Sunday, played his first two NFL seasons (2012-13) under then-Bengals defensive coordinator Mike Zimmer. Zimmer is now the head coach of the Vikings. The 28-year-old Iloka could replace Andrew Sendejo at strong safety with the Vikings and pair with All-Pro free safety Harrison Smith. –Seattle Seahawks rookie running back Rashaad Penny will be ready for the team’s season opener against the Denver Broncos, coach Pete Carroll announced. Penny, who was selected 27th overall by the Seahawks in the 2018 draft, sustained a broken finger in practice last week. Multiple media outlets reported that he would be sidelined for three to four weeks. Penny had been competing with Chris Carson for the starting running back job with the Seahawks, who had only one rushing touchdown outside of quarterback Russell Wilson. –Los Angeles Rams defensive tackle Ndamukong Suh said he has “no hard feelings” toward the Miami Dolphins following what could be perceived as a negative comment on Instagram about the team’s rush defense. Suh’s comment came on a play that saw Carolina Panthers running back Christian McCaffrey bolt for a 71-yard touchdown run in a preseason game against the Dolphins. The play was posted to the NFL’s Instagram account. “Right up the Gut lol,” the 31-year-old Suh wrote. –Former Carolina Panthers defensive end Charles Johnson announced his retirement from the NFL, the team said. Johnson spent his entire career with the Panthers and played in a franchise record 143 games. He ranks second behind Julius Peppers on the franchise’s all-time sack and forced fumbles lists. The 32-year-old Johnson said that his body was giving him pronounced clues to retire after he underwent back surgery last year. Johnson collected 352 tackles, 67.5 sacks and 20 forced fumbles in 143 career games since being selected by the Panthers in the third round of the 2007 draft. –Defensive tackles Tani Tupou and Nigel Williams signed the Arizona Cardinals, the team announced. To make room for Tupou and Williams on the roster, the Cardinals released tight end Chris Bazile and Austin Wolf. The 6-foot-1, 284-pound Tupou played in one game for the Atlanta Falcons last season, spending the majority of the 2017 season on the Falcons’ practice squad. Tupou was signed by the Seattle Seahawks in 2016 as an undrafted rookie free agent Washington and played one game with the Seahawks as a rookie. In three seasons at Washington, Tupou played 33 games and had 37 tackles, 5.5 tackles for losses and a fumble recovery. –The New York Jets released kicker Cairo Santos, the team announced. Santos, who was the first Brazilian native to play in the NFL, signed a one-year, $2-million contract with the Jets in March. The 5-foot-8, 160-pound Santos joined the Jets after the team saw fellow kicker Chandler Catanzaro sign with the Tampa Bay Buccaneers as a free agent. Per ESPN, coach Todd Bowles said the Jets opted to cut Santos because he wasn’t ready to kick in Friday’s preseason game against the New York Giants because of a chronic groin injury. –The Indianapolis Colts signed free agent running back Tion Green, the team announced. To make room for Green on the roster, the Colts waived running back Josh Ferguson with an injured designation. If Ferguson clears waivers, he will be placed on the Colts’ Injured-Reserve list. The 6-foot, 220-pound Green re-joins the Colts after first signing with the team earlier this month and then being released. He played in five games with the Detroit Lions as a rookie in 2017 and totaled 42 carries for 165 yards and two touchdowns. Green also caught two passes for 14 yards. –Defensive lineman Cedric Thornton of the San Francisco 49ers is retiring after seven seasons in the NFL, the team announced. He signed with the team on July 25. The 49ers signed defensive tackle Chris Jones to a one-year deal to replace Thornton on the roster. The 6-4, 290-pound Thornton was signed by the Philadelphia Eagles in 2011 as an undrafted free agent out of Southern Arkansas. Thornton played in 89 games, with 48 starts, over seven seasons with the Eagles (2011-15), the Dallas Cowboys (2016) and the Buffalo Bills (2017). He recorded 278 tackles, 7.5 sacks, six passes defensed, four fumble recoveries and two forced fumbles. He added six tackles in three postseason games. The 6-1, 293-pound Jones, a five-year veteran, is beginning his second stint with the 49ers, who claimed on him waivers from the Miami Dolphins in 2016. He started the final six games of the 2016 season for the 49ers, making 21 tackles. –Rookie quarterback Josh Rosen of the Arizona Cardinals sat out practice on Wednesday because of what is being described as a minor thumb injury, but is expected to play in Sunday’s game preseason game against the Dallas Cowboys. Rosen, the 10th overall pick in the draft out of UCLA, sustained the injury during practice on Monday when he hit his throwing hand on a teammates helmet while throwing a pass, Cardinals head coach Steve Wilks said. The 6-4, 218-pound Rosen was impressive in the Cardinals’ game last week while playing behind the projected starting line against the New Orleans Saints. Rosen completed 10 of 17 passes for 107 yards and a touchdown with no interceptions, with a long gain of 21 yards and a quarterback rating of 102.9. –Wide receiver Kenny Britt was released by the New England Patriots, the team announced. The 29-year-old is a veteran of nine NFL seasons with the Tennessee Titans (2009-13), the St. Louis/Los Angeles Rams (2014-16), Cleveland Browns (2017) and the Patriots. Britt signed a free agent contract with the Patriots on Dec. 13, 2017, after being released by the Browns five days earlier. The 6-foot-3, 230-pound Britt was a first-round pick of the Titans (30th overall) out of Rutgers, the first No. 1 selection in school history, in the 2009 draft.